Nice watch for the money. This watch is so classy looking. (I bought 2). It is a very dark brown, so it can be worn with many colors including black. I have received many compliments. This watch is perfect for me! I have small wrists and did not want a big watch, but needed a large face with large hands so I could see the time without my reading glasses. This watch fit all my requirements. And it is so attractive. I receive many compliments. This is a very classy, every day watch, however, the face is so large that I am concerned about scratching the glass. The quality of the watch is supurb and I will wear it with planned casual outfits -- just not every day as I do not want it to scratch, it is so pretty. I use this watch nearly every day and love it. The face is the perfect size. The only downside is that it looks a little too dressy for work out clothes--just does not seem to fit. Other than that, it keeps great time and I have received several compliments when wearing it. What a beautiful watch! I've only had it one day and have received several compliments on it. The price was unbelievable. I would highly recommend this watch to purchase. I like this large face watch. I usually wear smaller face watches, but decided to make a change. It looks expensive and it is enjoyable to wear. I purchased this for a gift and my cousin says the band is comfortable, it keeps time and she get compliments every time she wears it. Looks more expensive. Love it. 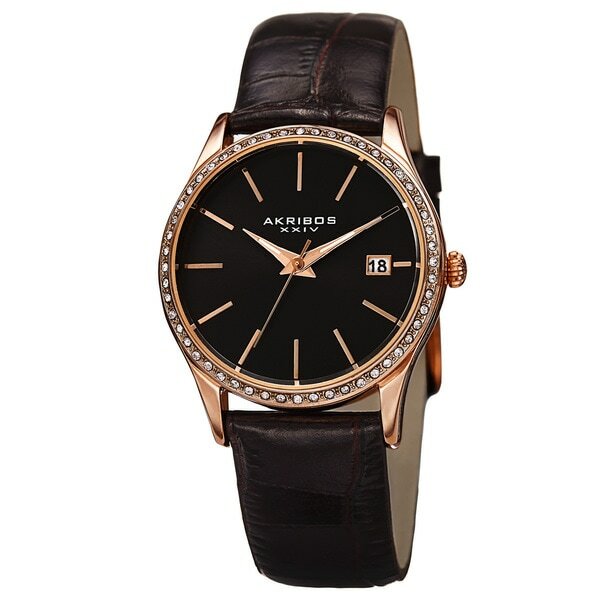 Attractive style and with a leather band instead of an expansion band. I have 30+ watches but I didn't have one that was rose gold with a black strap. I have a few Akribos XXIV watches. They have served me well.